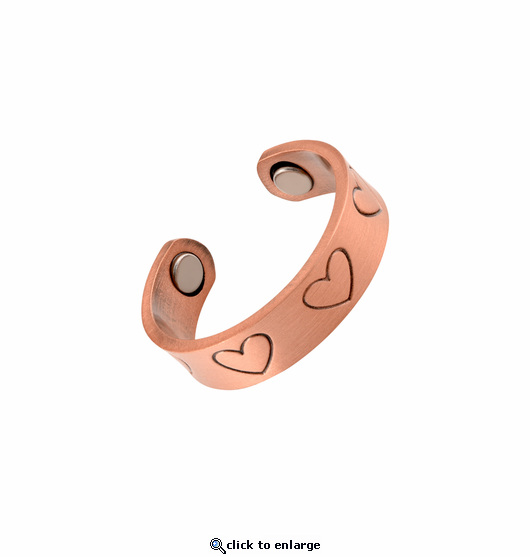 This is a nickel free hearts adjustable copper magnetic ring. It has a 1500 gauss neodymium rare earth bio north facing magnet on each end. It is about 1/4" wide. It will fit small to medium finger ring sizes about 6 - 9. About a year ago, I looked around where I live and I could not find suitable thumb rings. I had to buy rings that were solid and they would cut into the skin. I am happy with these rings because they have style, they match and I can adjust them if necessary. If I would make the purchase again, I would try getting rings just a bit larger, because my thumbs are rather stout....but overall, I do like these rings with the hearts! I LOVE the ring.....it isn't tight as it is adjustable and looks nice too as I wear it on my thumb. So far, I see a slight difference and I am anxious to see what happens in 2 months. Will order from them again...great prices, great shipping!! This ring is very pretty and works very well. Of all the pieces I have purchased form you, this is probably my favorite. I have carpal tunnel and this is exactly what I needed to keep my pain manageable! Will shop with you again! I HAVE A LOT OF PAIN IN MY LITTLE FINGERS FROM OSTEO. ARTHERITIS. SINCE I PUT THESE RINGS ON MY LITTLE FINGERS THE STINGING PAIN OF THE CHANGES IN THE JOINTS HAVE STOPPED. I wear this ring on my second toe to relieve pain in my foot for arthritis. It certainly helps keeping it from getting so stiff. Rings do contribute to pain relief and I've never taken them off since I received them. Products are proving to live up to claims, and customer service is topnotch! I was unsure when I bought this whether it would help or not, but the nickel-free and adjustable aspect helped sell me on it. I am extremely happy with this purchase. It looks great, more delicate than the magnified picture. It's easy to adjust, although it does NOT easily adjust itself just from using your hands (I'm a cashier at a busy grocery, wear my ring to work every day, never had it squash my finger). The finger I wear it on has been painful for 4 or 5 years, but 1/2 day wearing the ring and the pain was gone. Now I wear the ring because it's pretty. I have arthritis in my thumb and I have had my ring for about a week now. I didn't think it was working until I forgot to put it on, after awhile I began to have pain in my thumb. I wasn't able to bend it without my nuckle popping. It is popping a little with the ring on, but not near as much as without the ring. I would recommend this for anyone with arthritis in their fingers. I purchased the copper ring to help relieve some pain and weakness in my left thumb from arthritis. I picked the ring with hearts because I love the heart pattern. When I received the ring I was pleased with the quality and it looks nice. I immediately put it on my thumb and have not taken it off yet. The pain in my thumb was gone within 24 hours and I am no longer experiencing the weakness. The ring is working for me and I would buy another one if I lose this one. I am wearing it on my thumb and it has stopped my arm from going to sleep. I am very satisied. Also have the magnetic ankle bracelet ND IT HAS HELPED MY LEG AND BACK. This is a pretty ring that I can wear daily! It meets my expectations and the price was reasonable! I recenty ordered a new bracelet for myself and convinced my wife to try one of your copper magnet rings. She has arthritis in her hands, particularly her right index finger. She says the ring helped with joint movement from the instant she put it on! She even get compliments on the rings appearance.